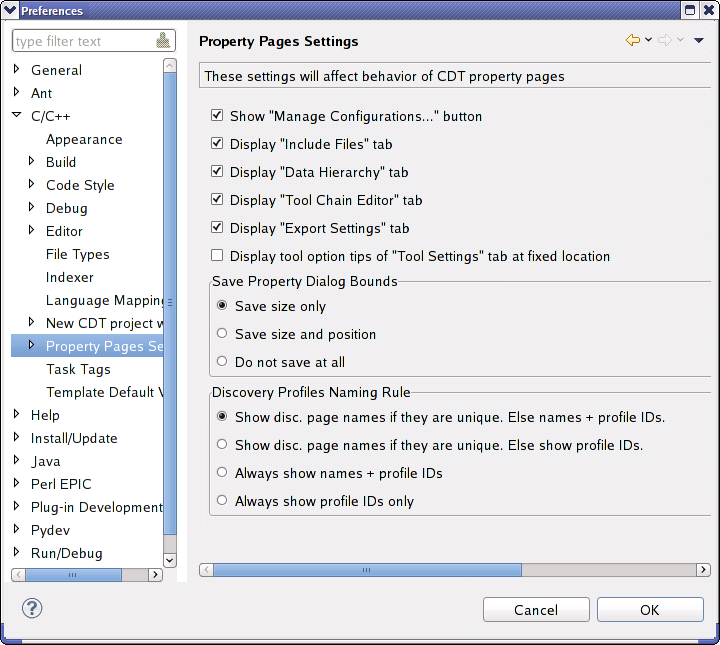 Use the Property Pages Settings preference panel to set the behaviors of CDT property pages. Show 'Manage Configurations...' button Shows or hides corresponding button, normally placed on every property page. If this button is hidden, Manage operation can be accessed from Main Menu or Context Menu. Display 'Include Files' tab Displays a tab under 'Paths & Symbols' showing files which are included by default. These included files will be parsed before source, even if they're not explicitly #include'd by the source file. Corresponds to the '-include' switch on GNU compilers. Display 'Data hierarchy' tab Displays auxiliary tab which allows browsing data of project configurations. This feature is useful for debug purposes mostly, so it's disabled by default. Display 'Tool Chain Editor' tab Shows or hides corresponding tab. Normally, users need not to edit tool chains manually. Show disc. page names if they are unique. Else names + profile IDs. Show disc. page names if they are unique. Else show profile IDs.